Arbor Teas Recognized for its Green Initiatives!Congratulations to our business partner Arbor Teas! 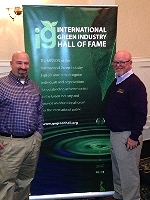 On March 28, Arbor Teas had the special honor of being inducted into the International Green Industry Hall of Fame! After a blind nomination process and a review by their Board of Directors, Arbor Teas was selected for conducting business with a genuine commitment to environmental stewardship. Arbor Teas became the FIRST tea company in the United States to deliver a full line of organic loose teas in backyard compostable packaging. With the release of this next-generation packaging, Arbor Teas advanced their environmental mission, continuing their commitment to sustainable business practices. For the first time ever, tea drinkers are now able to compost their tea leaves AND tea packaging together in their home composting system! Arbor Teas is an excellent example of a HRWC business partner, supporting clean water initiatives for the Huron River! We thank them for their stewardship.